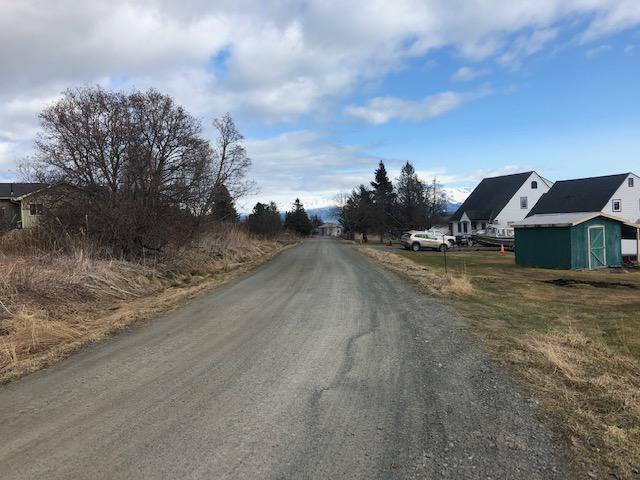 Bruce Street is one of the many of roads maintained with funding from road grants in Kachemak City. It’s easy to complain about potholes and poorly maintained roads. But one community has been taking road repair into its own hands. Kachemak City sits on the southern Kenai Peninsula and it offers grants to residents to fix roads. Some residents say DIY roadwork beats higher taxes. Taz Tally used a run-of-the-mill garden rake to smooth out some ruts on his neighborhood road in Kachemak City this week. As he raked, he discussed the technical term for the gravel. “That's the D1 gravel, which is what you want for a good quality road,” he said. Tally has learned quite a lot about road maintenance in recent years. “Well, if someone had ever told me that I'd be a road boss, I would have said you're crazy,” he said. Tally has been filling potholes and doing other road work on Bruce Street for about 10 years because the alternative is paying the city via taxes. In the past, Kachemak City said it would raise property taxes to do so. The city chose to stick with its road grant system, which has been around in various forms for over 30 years. Now, groups of up to five properties can apply for grants of about $1,400 to help maintain their section of road, but in order to get that money, residents need to have skin in the game. They need to spend about $700 of their own money. Tally said most residents use the grants from the city to hire professional contractors. “We put our heads together to find out what do you think we can do this year and put it out to bid and we get the quotes in and make up the grant request to Kachemak City,” he said. Tally said the program allowed him and his neighbors to pay for everything from sanding and plowing to fixing culverts. But some of the work, Tally said they’ll do on their own. While this blend of private-public partnerships is saving money, the city is only able to give out roughly $50,000 each year. Kachemak City Mayor Bill Overway said that money comes from the state. Tally is far from the only one applying for these grants. Kachemak City resident of 36 years, Nick Varney, said the grant money has been a godsend. In the past, he would use more of his own money to pay for road maintenance. Back at Tally’s house, he said he’s not sure if he’d prefer for Kachemak City to take over the work. Besides now, he and his neighbor, former House Rep. Paul Seaton, are compelled to do it. However, the money that allows these residents to take road maintenance into their own hands comes from the state and the city says the state’s fiscal crisis could affect the program in the future. This year’s grant applications for road maintenance are due Monday. The Homer City Council postponed its decision Monday on whether to extend city water services to a low-income housing development outside of city limits. East End Partners offered the city $100,000 to provide city water services at the site in Kachemak City. However, the ordinance would not allow other residents outside of city limits to access Homer city water. The council wants the Kachemak City Council to decide whether it will write a letter of support for the ordinance before it votes on the measure. The Kachemak council will meet Tuesday.